Riley Michael Sheahan (born December 7, 1991) is a Canadian professional ice hockey centre for the Florida Panthers of the National Hockey League (NHL). Sheahan was drafted 21st overall by the Detroit Red Wings in the 2010 NHL Entry Draft. Sheahan performed well enough at Canada's 2011 National Junior Team prospect camp in the summer of 2010 and was asked to come back to the Selection Camp in December 2010. Sheahan played junior B ice hockey in the Greater Ontario Junior Hockey League with the St. Catharines Falcons playing both centre and wing. During his first season with the Falcons, Sheahan played with Atlanta Thrashers first round pick Daultan Leveille. Sheahan collected 49 goals and 85 assists over two seasons with the Falcons. Following the two seasons in St. Catharines, Sheahan decided to forgo major junior hockey with the Erie Otters of the Ontario Hockey League (OHL) to play NCAA Division I college ice hockey with the University of Notre Dame Fighting Irish of the Central Collegiate Hockey Association (CCHA). On April 5, 2012, the Detroit Red Wings signed Sheahan to a three-year, entry-level contract. On April 7, 2012, he made his NHL debut for Detroit against the Chicago Blackhawks. On January 11, 2014, Sheahan scored his first career NHL goal, against Jonathan Quick of the Los Angeles Kings. On July 1, 2014, the Detroit Red Wings signed Sheahan to a two-year, $1.9 million contract extension. On June 16, 2016, the Red Wings signed Sheahan to another two-year contract extension. On April 9, 2017, Sheahan scored his only two goals of the 2016–17 season during the final game at Joe Louis Arena, including the final goal in the arena's history. Sheahan had set a team record for the most games to start the season without a goal and he also set an NHL record as the only forward with at least 100 shots to start the season without a goal. Sheahan in a game against the Washington Capitals in 2017. On October 21, 2017, Sheahan was traded to the Pittsburgh Penguins (along with a fifth-round pick in the 2018 NHL Entry Draft) in exchange for Scott Wilson and a third-round pick in 2018. 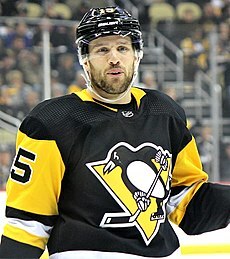 On June 27, 2018, Sheahan signed a one-year contract with the Penguins. On February 1, 2019, Sheahan was traded to the Florida Panthers (along with teammate Derick Brassard, a second-round pick and two fourth-round picks) in exchange for Nick Bjugstad and Jared McCann. On October 29, 2012, Sheahan was stopped by police in Grand Rapids, Michigan, after which a roadside test determined he was driving with a blood-alcohol level of 0.30, well over the legal limit. Sheahan was wearing a purple Teletubby costume and was carrying the ID of fellow Red Wings' prospect Brendan Smith when arrested. He told police he was carrying Smith's ID so he could get into bars, as he was underage at the time. Sheahan pleaded guilty in Michigan's 61st District Court on December 13, 2012, to operating a car with a blood-alcohol level of 0.17 or higher. He was sentenced to one year probation and ordered to spend 49 hours on a work crew. Sheahan had previously been arrested on alcohol-related charges when he was charged with public intoxication and consumption of alcohol by a minor in 2010 when he was a freshman at Notre Dame. ^ "Falcons season statistics". Archived from the original on September 27, 2011. Retrieved June 26, 2010. ^ Bowness, Rick (April 5, 2012). "Wings sign Sheahan to entry-level deal". Detroit Red Wings. Retrieved April 5, 2012. ^ Beam, Todd (April 6, 2013). "Wings recall Riley Sheahan". Detroit Red Wings. Retrieved April 6, 2013. ^ Roose, Bill (July 1, 2014). "Sheahan gets two-year extension". Detroit Red Wings. Retrieved July 1, 2014. ^ Kujawa, Kyle (June 16, 2016). "Detroit extends Sheahan and Lashoff". Detroit Red Wings. Retrieved June 16, 2016. ^ Savage, Brendan (April 9, 2017). "Watch Red Wings' Riley Sheahan end 79-game drought with first goal". MLive. Retrieved April 9, 2017. ^ Sipple, George (April 9, 2017). "What slump? Riley Sheahan scores two goals in Joe Louis Arena finale". Detroit Free Press. Retrieved April 9, 2017. ^ Kujawa, Kyle (October 21, 2017). "Scott Wilson and third-round draft pick acquired from Pittsburgh". Detroit Red Wings. Retrieved October 21, 2017. ^ "Penguins re-sign Riley Sheahan to one-year contract". sportsnet.ca. June 27, 2018. Retrieved June 27, 2018. ^ a b c "Riley Sheahan pleads guilty". ESPN. December 13, 2012. Retrieved November 16, 2018. This page was last edited on 7 April 2019, at 23:36 (UTC).